Did you know approximately one in four Americans has a criminal background of some kind? Given this reality, it is certain that you will come across applicants whose criminal records you’ll have to consider. The EEOC argues the right approach is to take into account individual circumstances through the practice of individualized assessments. In this whitepaper, we look at recently issued guidance from the Equal Employment Opportunity Commission (EEOC) to employers concerning the need for such assessments. 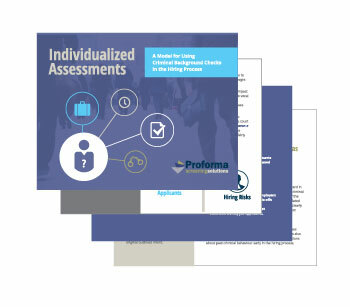 We try to clear up the misperceptions and bring clarity to the meaning of individualized assessments and offer a model you can follow to design a hiring process that is both fair to applicants and effective in managing your organization’s human capital risk. To receive your instant PDF download simply complete the form on this page.